We think you will love Tapestry! Give us 20 minutes and follow our tutorial. 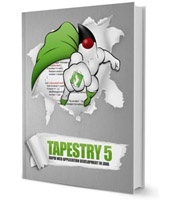 Tapestry 5 - Rapid web application development in Java is a comprehensive guide, introducing Apache Tapestry and its innovative approach to building modern web applications. The book walks you through Tapestry 5, from a simple Hello World application to rich Ajax-enabled applications. Written by a core committer, this book provides deep insight into the architecture of Tapestry 5. It not only shows you how to achieve specific goals but also teaches you the "why". You learn how to build modern, scalable Web 2.0 application with a component-oriented approach. This book also shows how Tapestry brings scripting language productivity within reach of Java developers without sacrificing any of Java's inherent speed and power. Alexander follows up his long series of Tapestry 4 tutorials with the first book on Tapestry 5. 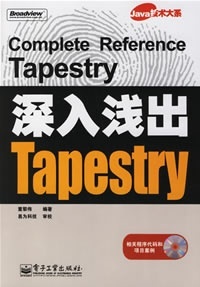 The first Chinese-language book to cover Tapestry (though Tapestry in Action has been translated). as a non-Chinese speaker, it's a bit hard to know what's between the covers, but looks like it gets into the nitty-gritty of Tapestry, Spring and Hibernate. Tapestry is an open-source web application framework written in Java. This framework is different from "standard" MVC frameworks (like Struts or WebWork) in that it is more of a component-oriented framework. A component-oriented framework (like JavaServer Faces) allows you to create re-usable components that you can then re-use on other projects with the ability to re-configure these components to suit a specific purpose. Tapestry 101 will introduce readers to this framework that is growing in popularity more and more. The focus of this book is to guide you through designing and implementing your application and providing information that you can improve on it with your own custom components. "Tapestry 101's focus is about getting things done, from a user's perspective not a Tapestry developer's. It covers the issues you'll face building real applications." 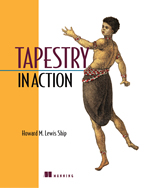 Enjoying Web Development with Tapestry by Kent Tong covers Tapestry 4.1 (with AJAX). Previous editions covered 4.0 and 3.0. Available in PDF and hard-copy formats.